While the majority of schoolboy footballers in Ireland will be still enjoying the Christmas holidays, some of the lucky elite will be gearing up to compete in the Champions Cup. The Champions Cup, now in it’s 4th year running, will see The 2014 season SFAI Cup Champions (Under-13 to Under-16) face-off against their 2014 Northern Ireland Boys Football Association (NIBFA) National League counterparts, with the event taking place on December 27th in Dundalk’s Oriel Park. The event plans to give the players the chance to perform on a unique stage in front of expected large crowds and heads of recruitment from the UK’s biggest clubs. While last year each DDSL side who competed in the tournament won their respected age group, the competition it expected to be even harder this year, so high quality is a guarantee for the event. With last years Champions Cup proving a huge success, which was held in Dundalk’s Oriel Park, the event will once again be brought back to the airtricity league champions home ground. The Champions Cup began as a one-off two-legged Under-15 contest three years ago, as St Oliver Plunkett’s beat Shelbourne. Once again the Dublin District Schoolboy League’s best represent each age group and will surely set their sights on more glory. St. Joseph’s Boys will represent The Republic of Ireland at under -13 level as the SFAI National Cup champions of their respective age group. St. Joseph’s Boys, located in Sallynogin, Co. Dublin was founded in 1953 by Fr. Frank McCabe and Brendon Harmon ‘to provide youth services through football for children in the greater Dun Laoghaire area’. 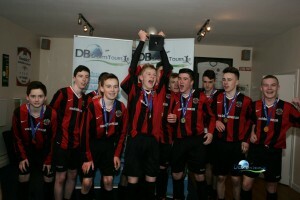 The South Dubliners will clash with Linfield in their Under-13 final. Linfield are known to be one of Northern Ireland’s clubs, who’ve won a record 51 Irish League titles. The under-14 final will see St. Kevin’s Boys play Coleraine. St. Kevin’s Boys are known to be one of the most successful clubs in Ireland at schoolboy level, with a host of players making the move to English clubs every season, such as DB Sports Tours starlets Trevor Clarke, Anto Dolan, Graham Kelly and Darragh Leahy. Coleraine are one of the few clubs synonymous with success in schoolboy football in Northern Ireland. Coleraine, who were founded in 1927, were formed out of a merger between two local sides: Coleraine Olympic and Coleraine Alexandra. The under-15 final sees St. Francis FC represent the SFAI as the champions of their age group, and play Linfield who will feature in their second final in this year’s Champions Cup. St. Francis FC was formed in 1958 in The Liberties, in the Dublin inner-city, while they now play their games in JohnHylandPark, located in Baldonell, near Clondalkin. Finally, the under-16 final sees St. Kevin’s Boys play the Crusaders. St. Kevin’s Boys, who will feature in both the under-14 and under-16 final and will look to build upon the success of their season wherein they became SFAI under-16 Champions and will fight to win the honor of the best side on the island of Ireland in their respective age group. Crusaders meanwhile, who hail from Belfast and were founded in 1898, will be buoyant going into the one-off tie having been crowned champions of the National League of the Northern Ireland Boys Fa. Admission for the Champions Cup will be €5/£5 for adults while kids under 16 will pay €2/£2 and all kids under 12 will have free admission.